In 1960, His Majesty King Bhumibol Adulyadej, accompanied by Her Majesty Queen Sirikit, undertook a series of state visits to the United States and fourteen European nations. Her Majesty knew that when abroad, She would be representing both Thailand and Thai women. Thus, in addition to Western high fashion, Her Majesty wished Her wardrobe to contain Thai styles that would convey the country’s unique cultural identity. She assembled a team of consultants and advisors that included historians, prominent ladies of the court, and Thai fashion designers. The team, led by Her Majesty, created a group of dresses based upon the wrapped and draped styles Thai women had traditionally worn—hip wrappers (phaa nung) and shoulder cloths (sabai)—but constructed according to Western dressmaking techniques. The result of this research and experimentation was a new national dress, still worn by Thai women. From the 1950s onward, HM Queen Sirikit accompanied HM the King on visits to villages around Thailand, so they could understand firsthand the hardships facing rural Thais. Their Majesties realized that providing monetary assistance or goods to people who are in need is not a long-term solution to their difficulties. Her Majesty, knowing that Thai people have highly developed handicraft skills, decided to promote their production of handwoven textiles and other crafts to supplement their income. The SUPPORT Foundation, under Her Majesty’s patronage, was established in 1976. Today, many of its projects are still active, including the Neun Thammang SUPPORT center in Nakhon Si Thammarat province. It was established after His Majesty had decided to help resolve water problems in that area. The Queen first encouraged Neun Thammang villagers to weave jute products and cotton and silk fabrics for sale. Her Majesty was also aware of the fame of the gold brocades from Nakhon Si Thammarat made for the royal court in the 19th century, a skill that has been lost for more than 100 years. She requested the revival of these royal textiles, sending a brocade master to train people there in the proper weaving techniques and natural dyeing. Today, weavers from Neun Thammang and the nearby village of Baan Trok Khae can weave these exquisite brocades, which are to be used for costumes for royal Khon performances. 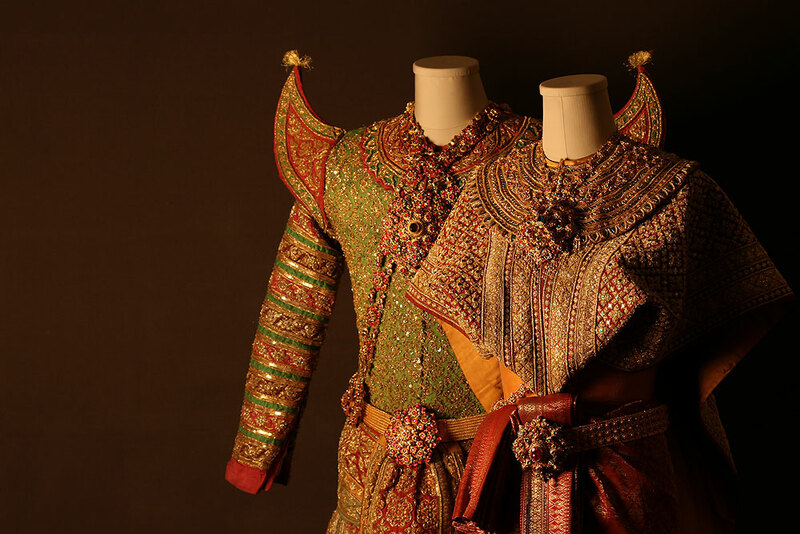 Her Majesty’s efforts to assure the preservation of Thailand’s textile arts for future generations have helped revive the old crafts, whose use and production would have disappeared entirely were it not for Her Majesty’s initiatives. In addition, She has supported Khon, a traditional style of masked court performance that was no longer popular and in danger of being lost. Khon dances tell stories from the Ramakien (the Thai version of the Hindu Ramayana) using distinctive, stylized steps and gestures; specially embroidered costumes; intricately carved and painted masks, and music performed on Thai instruments. Her Majesty valued Khon as a beautiful and characteristically Thai performing art. She decided to preserve all the crafts needed for Khon including mask-carving, gold-brocade weaving, lavish embroidery, and reproducing jewelry.